Suddenly, coal seam gas (CSG) is on everyone’s lips. The big issues — water table contamination, public health risks, air pollution and the industrialisation of rural landscapes — are becoming well known. But little more than a year ago the social movement against gas was still just beginning to take off. 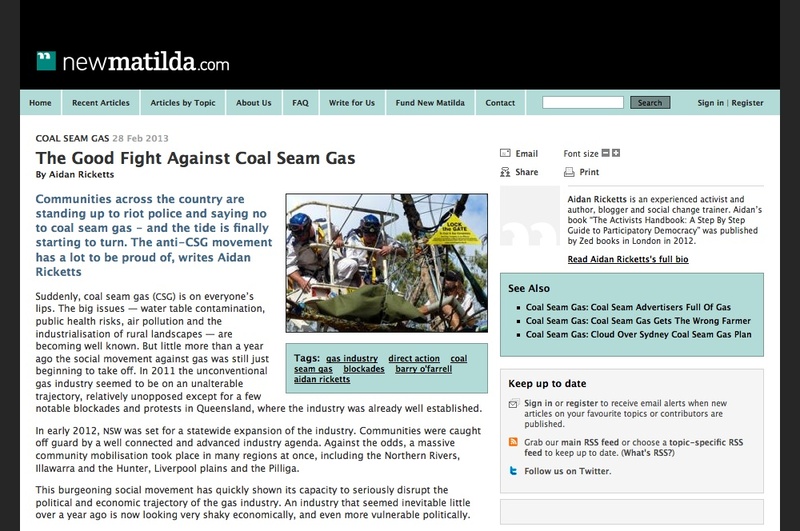 In 2011 the unconventional gas industry seemed to be on an unalterable trajectory, relatively unopposed except for a few notable blockades and protests in Queensland, where the industry was already well established. In early 2012, NSW was set for a statewide expansion of the industry. Communities were caught off guard by a well connected and advanced industry agenda. Against the odds, a massive community mobilisation took place in many regions at once, including the Northern Rivers, Illawarra and the Hunter, Liverpool plains and the Pilliga. This burgeoning social movement has quickly shown its capacity to seriously disrupt the political and economic trajectory of the gas industry. An industry that seemed inevitable little over a year ago is now looking very shaky economically, and even more vulnerable politically. The NSW Government recently performed a startling (if unsatisfying) backflip that has surprised and stunned the industry. Less than six months ago the government proudly gave the industry the green light by renewing expired licences and releasing a policy that said no part of the state would be off limits to gas exploration and development. Last week, however, they began what will likely be a series of political backdowns as they try to contain the growing power of the movement. A smart combination of community mobilisation, political and economic strategies and most notably robust direct action has shaken the confidence of government and the gas industry and looks set to continue to do so. Unconventional gas mining encountered little in the way of direct resistance in NSW before 2012. There had been a powerful stand off with farmers at Liverpool plains but the first arrest was near Casino, during an action at Metgasco’s holding ponds in June 2012. The first serious blockade in 2012 occurred in August at Fullerton Cove near Newcastle, and by November a long running blockade was established at Glenugie near Grafton. As predicted, the NSW Government responded to these first protests with a massive show of police force designed to shock protesters and demonstrate that resistance was futile. The movement was well prepared however — even during the riot police action at Glenugie protesters were being reminded that this was merely a symbolic show of force. The persistence of the people 365 days of the year would be far more powerful. This turned out to be true; the installation of a drill rig at Glenugie was a costly victory for the gas company Metgasco. By the time the riot police forced access to the site in January 2013, the rig had remained idle in a compound in Casino for most of December at great cost to the company. The drilling operation was not a money maker, but merely an exploration well. The net cost to the company was so enormous that Metgasco abandoned a second planned drill site and proceeded immediately to Doubtful Creek near Kyogle. Even moving the drill rig from Glenugie to Doubtful Creek required a massive police presence, involving numerous vehicles, buses, cherry pickers, the rescue squad and police at both sites. Nonviolent direct action — by which we usually mean blockades, sit-ins and other forms of highly visible protest — is most effective in this form: when it is more than a temporary stunt, but an actual gritty action aimed to seriously stop or delay some destructive activity. It is also never a campaign strategy all on its own. Employed alongside political, legal, economic, media and public awareness strategies it becomes a powerful tool of social change. As I have argued previously, the power of CSG blockades lies not in winning on the ground on that one drill site, but in forcing the government and the companies into a self-defeating cycle of displays of overwhelming force, as they go about imposing an unwanted industry on unwilling populations by force. The important dynamic for communities involved in these campaigns is to remain optimistic and persistent. The ability to stand witness to displays of overwhelming force, while remaining assertive and nonviolent is the winning formula for sure. Regrouping and continuing to resist once the show of force subsides is vital; the only catch is we never really know how many times we need to repeat this process before the wheels start falling off the cart — but they are starting to fall off. Metgasco has in four months managed to complete two out of three of their planned non-productive test drills. Not one ounce of gas has been produced, and Metgasco’s share price has tumbled through several successive new low points. At the same time the much larger unconventional gas company “Arrow Energy” (aka Shell and Petro China) decided to let go of its assets in the hotly resisted Northern Rivers area and sold them for a “modest” payment to Dart Energy. Clearly the gas reserves of the Northern Rivers are starting to look like a stranded asset. Before blockades started in November, Metgasco’s share price was sitting around 20c, it dropped to about 18c by the end of November. During the long delay while the blockade held and its drill rig lay idle in December it fell to a new low around 15c. Despite some small fluctuations the price struggled to stay above 17c until February when it really started to fall quickly (see ASX chart below). The February fall was not so much associated with direct action success — although the Doubtful Creek protest camp was still in place. It was more likely due to growing evidence that politicians were finally starting to shift their positions on unconventional gas. In the federal seats of the Northern Rivers area, where so much of the determined resistance occurred, federal politicians of both major parties declared their opposition to the industry locally. Within weeks the NSW State Government, a staunch enabler of the industry, was attempting to protect itself from the political fallout from CSG plans in western Sydney and the Hunter region. The government finally did what the unconventional gas industry had spent years of lobbying trying to prevent: they declared some areas off limits to gas activity. The initial decision is a cynical exercise by the government to contain the fallout in residential areas and the Hunter, but the industry knows that once one community wins exclusion, others will follow. Direct action can’t claim all the credit for this political and economic shift in fortune. There are other strategies (including the very powerful gasfield-free communities strategy) under way, but Metgasco relies heavily on its gas licences in the Northern Rivers and as such it makes a useful case study. The much larger international player Arrow got out of the Northern Rivers once the scale of community resistance became apparent, but this option is not available for Metgasco. 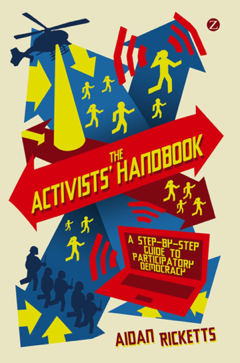 The point is that direct action can never be separated from its wider campaign context, but there is no doubt as to its power to empower social movements and communities, to slow down dangerous activities, to mobilise the wider community and to gain the attention of politicians and investors. The battle against unconventional gas — and ultimately against the ongoing investment in outdated and destructive fossil fuel technologies — has a very long way to run. Communities engaged in the good fight should congratulate themselves for their grit and persistence. We should prepare for a long struggle, knowing that success is not measured by how many individual blockades are breached by riot police, or by symbolic victories won by the gas companies. The persistence of resistance of local communities will win out. One can only begin to imagine how different the politics and economics of unconventional gas might look had affected communities not taken a robust stand. Thanks for this article Aidan, it sure helped to lift my spirits! People power has got to win this one as all I can think about are the similarities between this and Asbestos mining! “It is more than a temporary stunt, but an actual gritty action aimed to seriously stop or delay some destructive activity. It is also never a campaign strategy all on its own. Employed alongside political, legal, economic, media and public awareness strategies it becomes a powerful tool of social change”! • Accolades to Aidan Ricketts, aware undoubtedly of being blacklisted ramifications. Being targeted on the false pretences, because of the principled stance taken for the better Australia. Hence an urging appeal to whom it may concern corruption afflicted nation, where close-knit legal-eagles never break innate ethos to defy the untouchables. Also there was a get square mentality, where the way to handle a rebel who laid a glove on the establishment, was to get back such a nonconformist with even harder right. QCAT that meant to be a self-representative jurisdiction seems to grant routinely the privilege of legal representation to Govt Depts and its Agencies: “QCAT is reluctant to bite the hand that feeds it”, echoed blogosphere. At the time when a lay person in dire straits couldn’t get any. Law Society recommended lawyers declined — alike the community based legal centres such as: TAAS, TUQ, QPILCH and Caxton — floundered to champion justice! QCAT scheduled hearing on 19-03-13. Claim 0019/13 Soonton + Braun -v- Dept of Housing & Public Works. We are in our seventies and I know many at Doubtful Creek are of our age and health and it is to them I congratulate on standing firm in this dreadful weather (rain and more rain) for something that will affect their children and grandchildren as it will mine. I write letters constantly to the newspapers and to politicians and am pleased to say that no matter what the political persuasion of the newspapers, they always seem to print my opinions which proves that this tragedy to our lifestyles and future is not political and it is to be hoped that Premier O’Farrell will see sense and declare N.S.W coal seam gas free,(then the whole of Australia to follow) not just bits and pieces of the state, but all of the state. I was pleased to see on the TV news that Germany has stopped the coal seam gas fracking in that Country. I’m not sure, but I think U.S.A has done the same – come on Australia, our lives and country are precious to our lifestyle and survival. I agree wholeheartedly with the other replies. It is up to the people.As Bett from Doubtful Creek said, this will affect our children and grandchildren. We simply must stand up and fight against this. Our country is the most beautiful in the world. But we need to stand together and fight. Don’t let these people just walk in here and take it from us. That’s pathetic.